As a film critic, I dread dance movies. The plots are so similar they all seem to have been hatched from the same Dance Mom. Plus there’s no real character development, and the films are usually just a flimsy excuse to showcase a few dance sequences. So why not just post those dance moves on YouTube? 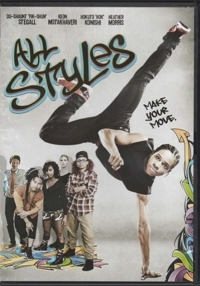 Well, it turns out that the first-time star of this film, 2013 So You Think You Can Dance winner Du-shaunt “Fik-Shun” Stegall, is already pretty YouTube famous as a top-notch hip-hop dancer. My teenage daughter is serious about dance, and she said this guy is seriously good. She had already watched most of his YouTube videos before I even popped in this movie to review. For her, it’s all about the dancing, and she gave the dancing in All Styles an A. The plot and the acting? That was a B, she said. And though I know far less about dance than she does, I’d have to agree. All Styles, though low-budget, is a cut above the average dance movie. The big surprise—other than Heather Morris (Brittany on Glee) turning up as one of the dancers—is that Fik-Shun isn’t just a terrific dancer. He’s also pretty charismatic on camera, a really likable fellow that makes you want to root for him. In this film he plays Brandon, who refreshingly isn’t from the “hood,” doesn’t have an attitude problem, and isn’t a delinquent who needs dance to turn his life around. All Styles dodges those clichés and in so doing, director Angela Tucker manages to create the most family-friendly hip-hop movie I’ve seen. No one in the film comes from the wrong side of the tracks, nobody has tattoos or uses bad language, and even the lyrics to the songs are the clean version. It’s all surprisingly wholesome, for a hip-hop film. Brandon’s father is a nice guy who, like Billy Elliott’s parents, just doesn’t approve of the boy’s dancing. It’s a bit trite, but Brandon’s mother was a world-class dancer who traveled a lot and died young of cancer. Rather than treasuring the time he had with her, Brandon’s father resents the time she spent traveling to perform. His thing is martial arts, and he runs his own dojo, with his son helping out. But the point is, he’s a strict but loving father who runs his own business, and Brandon isn’t a ne’er-do-well. He’s a bright student who goes off to Louisiana State University to study biomedicine, and he so immediately distinguishes himself that a tough professor makes him one of his research assistants. So there’s another positive message: you can be brainy and also hip, and you can pursue a “practical” career and also dance. When Brandon meets an African American woman who’s on the cheer team and also teaches ballet (another reinforcement that you can pursue multiple interests and passions), he’s invited to dinner and it’s like watching a reboot of The Cosby Show. As flippant as that sounds, I mean it as a compliment. Both of her parents are doctors, and both of them are also former dancers. More “you can do it all” reinforcement for youngsters who are watching and hopefully taking some of it to heart. There isn’t a negative role model in this film. And while I won’t play the spoiler, I do have to say that it’s also refreshing that All Styles doesn’t get on that dance competition track and just ride it out to a familiar conclusion. It’s refreshing too that the plot mostly plays out on a college campus rather than a rundown crime-ridden area. It broadens the arena for hip-hop in a meaningful way instead of leaning on stereotypes. The message: “All Styles” is also one of coming together, with Brandon and his “manager”-roommate recruiting not just hip-hop artists but a ballroom dancer, a ballet teacher, and even a zydeco dancer. All of those things are positives, but there are a few negatives. It’s overly familiar that a dance “crew” that Brandon was a part of would really take off after he leaves for college and also leave him behind, and just as familiar that he and his new ragtag dance crew would meet his old dance crew in a competition. When Brandon and his lab/dance partner rush from their bio presentations to the dance-off, it’s hard not to have flashbacks to High School Musical. What’s more disappointing, though, is that side plots aren’t really developed. Maybe that’s by design. Though a romantic interest is hinted at, nothing ever develops between Brandon and Lark (Tetona Jackson), and that might frustrate viewers who are as passionate about romance as they are about dance. But dance movies are dance showcases, and there’s plenty of good dancing here. If you have young dancers in the family, this film is a good one for family movie night.